The 69th Regiment was officially organized on December 21, 1849 as the 1st Irish Regiment. The following year the unit was mustered into the New York State Militia, eventually known as the New York National Guard, as the 9th Regiment. In May 1858, they were designated the 69th Regiment after consolidation with another regiment. 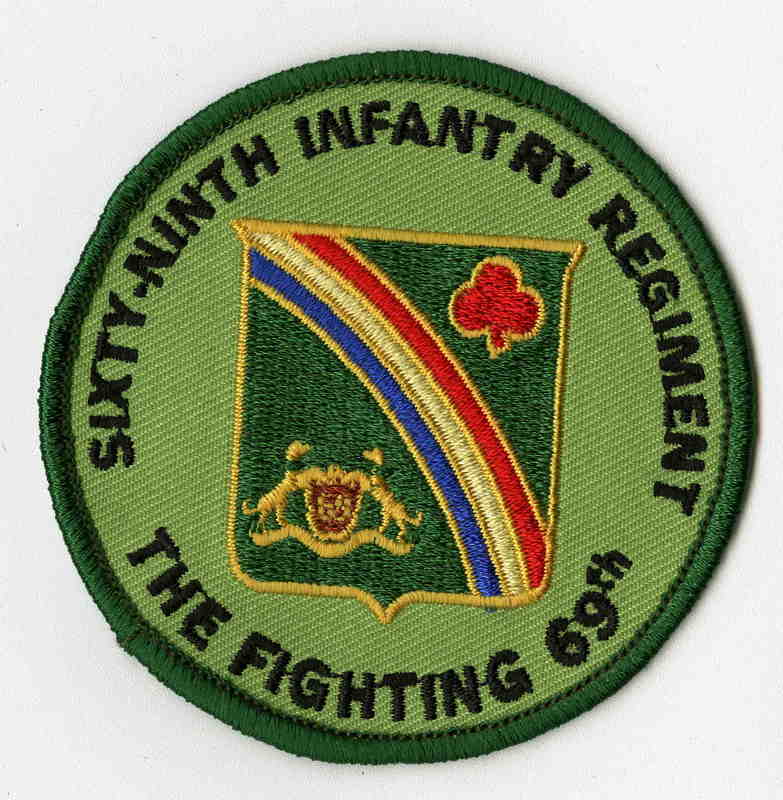 When the Civil War broke out, the all-Irish 69th Regiment saw action in many of the major battles of the Potomac such as the Battles of Bull Run, Antietam, Gettysburg, and Appomattox. It was during the Civil War that the 69th Regiment earned its nickname the “Fighting 69th.” It is said that Confederate General Robert E. Lee responded “Ah yes, that Fighting 69th,” after he learned Confederate troops would be facing the Regiment on the Fredericksburg battlefield. In addition to fighting in the South, the men of the 69th were also one of the regiments called upon to put down the New York City draft riots during July 1863. Almost thirty years later, the 69th was federalized again to participate in the Spanish-American War. However, the 69th never saw action and remained in training camps until the war ended. The men of the Fighting 69th were called to action again in July 1916, not to participate in the Great War in Europe, but rather to protect the Mexican Border as part of General John J. Pershing’s campaign against Pancho Villa. The men were sent to McAllen, Texas, where they remained until March 1917. The men paraded down Fifth Avenue upon their return to their armory on E. 25th Street. However, just one month later, the United States would enter the war in Europe and the 69th would once again be mustered into federal service. For more information on the Fighting 69th's role in the War, click to the next page. In the years following the First World War, the men of the 165th Infantry would gather together to memorialize their comrades who lost their lives overseas. The military might of the Fighting 69th did not end with the First World War. They would be called to federal service again during World War II, when they were sent to fight in the Pacific theater. Years later, the men of the 69th were part of the National Guard Units activated after September 11, 2001 and helped at Ground Zero. Five years later the Regiment was deployed to Iraq. Today, the Fighting 69th is still part of the National Guard and the Armory on E 25th Street is still in use. The armory was designated an official New York City landmark in 1983.